1550: Penetrates deep into the skin layers, specifically targeting concerns such as wrinkles or acne scarring. 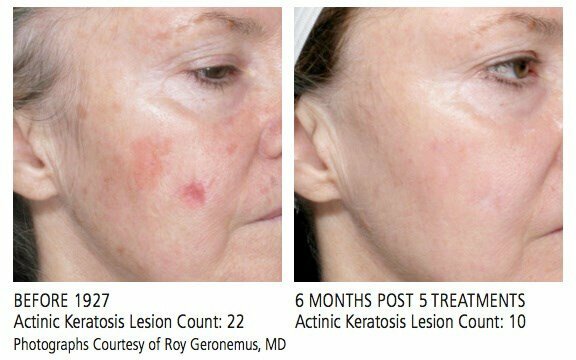 The Fraxel treatment is a safe, non-ablative laser skin procedure that can resurface damaged skin and uncover the youthful skin you long for. Desired outcomes are typically reached in multiple treatments. The speci c number of treatments is tailored to your goals and desired results as well as your lifestyle. We will work with you to identify the appropriate level of treatment and your preferred downtime. Depending on the level of the treatment, you may experience redness or swelling after the procedure which diminishes as quickly as the next day or over the next several days. Your skin will naturally bronze over the next week or two. As you continue with the treatment sessions, the sunburned-to-bronzed appearance will repeat after each treatment. As with a sunburn, your skin will ake and exfoliate normally, revealing fresher, glowing and smoother looking and feeling skin. *Potential side effects and risks include prolonged redness, swelling, scarring, infection, pigmentary changes (hyperpigmentation, hypopigmentation), herpes reactivation and acne are-up.